A block away from the Mitsukoshimae Station, a new attraction is stopping pedestrians in their tracks. The art installation — titled “Tree of Light” — is a massive digital tree made with about 10,000 LED lights, and it’s one of the many spring-themed pieces on display during the 2019 Nihombashi Sakura Festival. The festival is an effort to revitalize the historically rich Nihombashi district through seasonal art, food and hanami (cherry blossom viewing). The birthplace of a national highway system, Nihombashi prospered as a commercial hub during the Edo Period. However, the area faced economic decline during the 1900s due to the Metropolitan Expressway — which cut right through the neighborhood — and the shuttering of a major department store in 1998. In recent years, redevelopment projects like the COREDO Muromachi department stores have helped restore the area’s reputation as a thriving business district. Situated at the foot of a skyscraper in the Fukutoku Garden along Ukiyo-Shoji, the “Tree of Light” originally wooed art lovers at the Burning Man festival, a large-scale art and music festival that takes place every year in the Nevada desert. 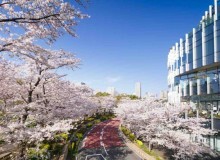 The 8-meter digital statue makes its debut in Japan as a symbol of the beloved sakura tree. Its 10,000 LED lights react to wind and sound, alternating between hues of pink, purple and green. The illumination creates a majestic and relaxing experience for those who pass it. The “Sakura Carpet” is another eye-catching installation on display during the festival. Located along Naka-dori between Coredo Muromachi 1 and 2, the 18-meter digital carpet is the brainchild of “nihonbashi β” — a collective of young creatives who work to revitalize Nihombashi through workshops and events. Monitors project a dynamic street of sakura petals and geometric designs onto the ground, with sensors that react to sound and motion. The interactive art piece invites people to stroll through and watch as digital flowers bloom at their feet. Pink lights will also illuminate important cultural buildings along Chuo-dori. 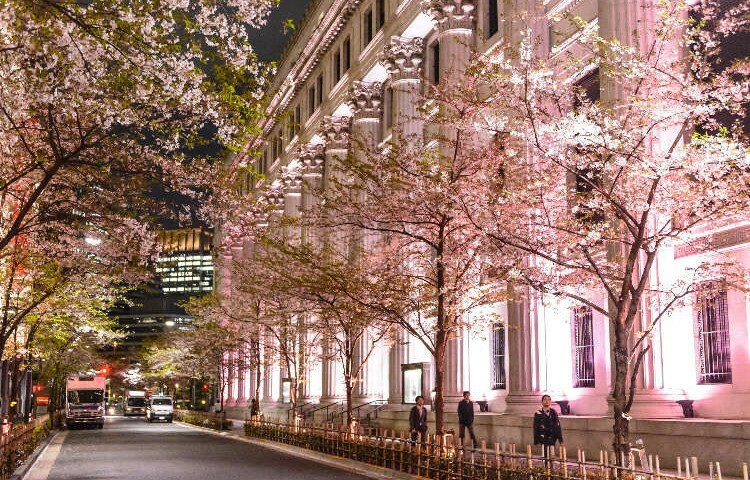 The massive columns at the base of the Nihombashi Mitsui Tower, the Nihombashi Mitsukoshi Main Store and the Mitsui Main Building will be blanketed in a cherry-blossom pink during evening hours to signal the coming of spring. 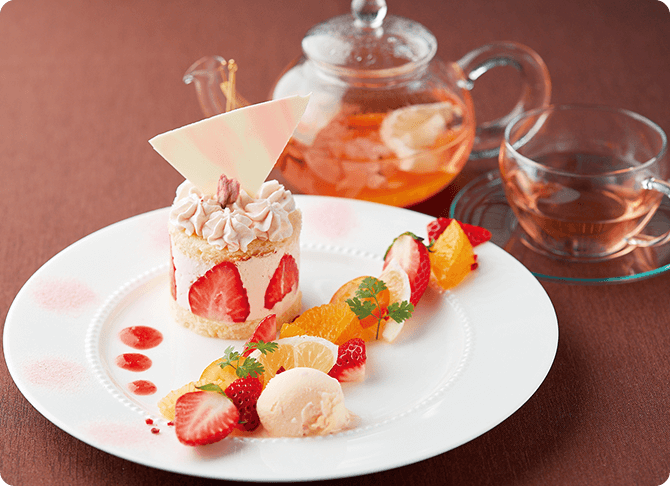 Nearly 190 businesses throughout the Nihombashi, Kyobashi and Yaesu districts will offer sakura-themed treats and goods for the festival’s “Sakura Menu Walk.” Photogenic desserts like pink mont-blancs and cakes, as well as savory sakura soba and bento boxes are available at select shops through April 7. To try a little bit of everything, visit the Sakura Food Stalls on March 30 and 31. A number of renowned, local restaurants will serve special menu items along Naka-dori and nearby areas in open air food stands for two days only. 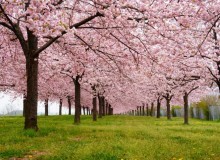 The sixth annual Sakura Festival will last until April 7. For the next several days, people can celebrate the coming of spring through art, food and other seasonal treats within the brightly-lit, historic Nihombashi district. 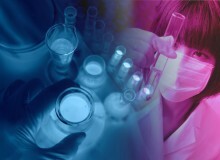 LivingRikejo: What’s in store for Japan’s Science Girls?